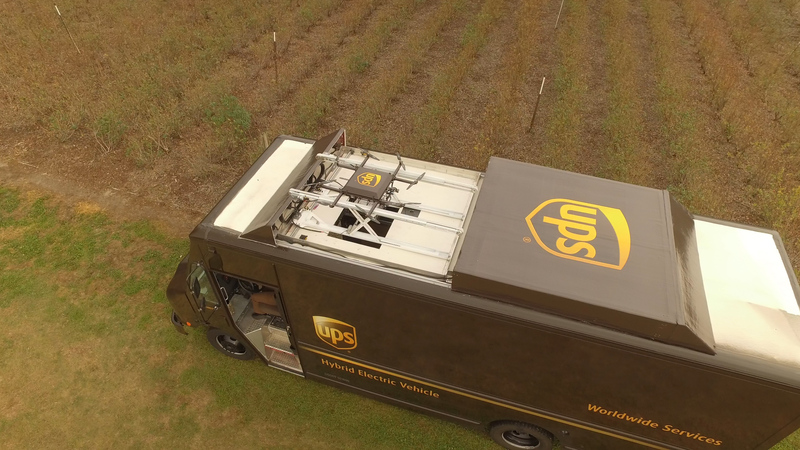 On a blueberry farm outside of Tampa, Florida, on Monday, UPS tested the use of drones for residential delivery for the first time. The logistics juggernaut specifically launched an octocopter, or multi-rotor drone, from the top of a delivery van. The drone delivered a package directly to a home, then returned to the van which had now moved down the road to a new location. The van pulled the drone down with robotic arms, to dock on its roof. The drone used in Monday’s test was made by Ohio-based Workhorse Group Inc., already a UPS technology supplier. Workhorse builds commercial, hybrid electric trucks, batteries and develops aerospace technologies as well. UPS has purchased 350 of its electric hybrid trucks, 125 of which are already on the road today. 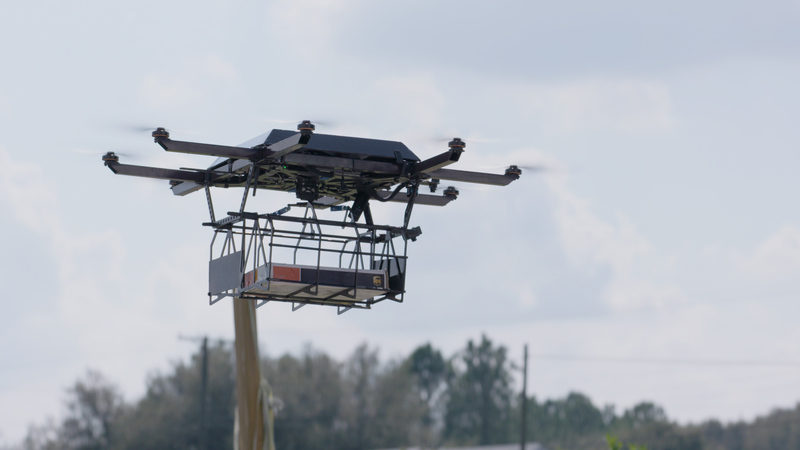 The company’s new HorseFly UAV Delivery system used in the UPS test was tailored to work with its vehicles. The truck for the test was custom-built to be able to launch the HorseFly drone from its roof, then grab it upon its return with robotic arms. A cage suspended beneath the drone extends through a hatch in the truck, where the drone can be lowered down and loaded up with another package. While docked, the drone recharges through a physical connection between its arms and the truck’s electric battery. The concept of delivery vans that launch drones is not new. Mercedes Benz and drone tech startup Matternet revealed plans to develop “Vision Vans,” which launch Matternet’s delivery drones from Mercedes-Benzs trucks, back in September of 2016. They unveiled a real world version of the delivery vans at CES, as well. According to UPS Vice President of Engineering, John Dodero, the company’s goal is to have drones work off of any type of vehicle, whether gas-powered or electric, to make last-mile deliveries. “That nest that we have on top of the car would be able to be put on any car, but we have to make sure it has the capabilities and it’s set up to do the charging,” he explains. As for the HorseFly itself, the 9.5-pound drone features a carbon fiber construction, is powered by a proprietary lithium 18650 battery pack, and capable of a 30-minute flight time at a top speed of 45 miles per hour, the company says. By contrast, most consumer drones will only fly for about 22 minutes. The HorseFly can carry a package up to 10 pounds, allowing UPS to handle a wide range of residential deliveries. For the test, the HorseFly had to stay within the line of sight of a pilot, per current FAA regulations. It also flew on a pre-configured route programmed for the purposes of the test. But in a real-world operation, UPS’s proprietary routing software, called the On-Road Integrated Optimization and Navigation, or ORION system, could be used to determine routes for drones to fly. 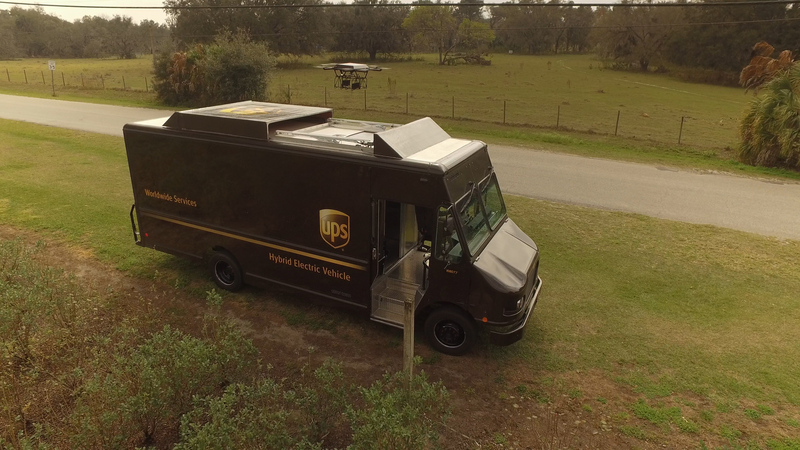 If the technology shapes up as hoped, one day a UPS driver could push a button on a touchscreen affixed to a truck’s dash to send a drone off to complete some deliveries. This would allow drivers to avoid roads that aren’t wide enough to accommodate their trucks, for example, and to shave miles off their route in rural areas where homes are far and few between. Drivers would not have to pilot drones, but could push a button to launch and recall them as needed. HorseFly’s guidance system draws from online databases covering airspace, topograhpic, weather and wind conditions, and data from on-board sensors like a GPS Compass, LIDAR, and infrared camera for landing. The whole system itself is built for redundancy, he adds. If one prop goes out, the drone could still fly. If two go out, it can at least land. And if the 4G LTE connection becomes unavailable– a strong possibility in rural areas– the drone could still communicate with the truck via RF. This is not the first time UPS has experimented with drone technology. The company’s earlier efforts have focused on humanitarian drone deliveries, as with its use of Zipline drones to deliver blood in Rwanda. Last fall, it also tested commercial deliveries to remote locations in partnership with CyPhy, a drone-maker in Boston that UPS invested in through its Strategic Enterprise Fund. But this is the first time UPS has revealed how it imagines drones could fit into its day-to-day operations. UPS does not hold an equity stake in the publicly traded Workhorse Group Inc.. It largely chose the company due to its current established vendor relationship and the progress Workhorse had already made on its drone technology. Rather than develop its own drones in-house, it makes sense that UPS would stick to a model that has worked for it on the ground, purchasing unmanned aerial vehicles like it purchases its trucks from others. Robotics talent is hard to get and even harder to keep these days, as Uber’s example in Pittsburgh shows. The on-demand transportation and delivery company originally poached a huge team away from Carnegie Mellon University and is now getting a taste of its own medicine, with Ford recruiting heavily from its ranks to develop self-driving cars. Meanwhile, the Federal Aviation Administration is still refining the rules that will govern widespread commercial use of drones. Drone malfunctions remain a serious concern for U.S. citizens, who generally want drone deliveries, but are worried about injurious mishaps, according to a survey by the U.S. Postal Service. They should be concerned, frankly. During a second, unofficial demonstration of the HorseFly for UPS on Monday, some sort of interference – possibly from the broadcast reporters’ cameras -caused an issue with the drone’s compass. The drone aborted its launch, tried to land on top of the UPS truck, fell to the side and was nearly crushed by the still-closing lid of the vehicle. “We’ve never seen it before,” said Burns, of the glitch. Beyond working out the technical kinks, companies like UPS and Amazon, which is building its own delivery drones, have to think about how they want to integrate this technology into their workforce, especially if it comes at the cost of people’s jobs or paid hourly work. UPS, for what it’s worth, says it doesn’t see driver jobs going away. “UPS drivers are the face of the organization. Customers depend on them,” says Dodero.